Russian-American novelist and labor leader; born in Podberezhye, government of Wilna, July 7, 1860. His grandfather was a rabbi and preacher in Vidz, government of Vitebsk; and his father was a teacher of Hebrew and Talmud. The family, which was devoutedly Orthodox, removed in 1866 to Wilna; and there young Cahan received the usual Jewish preparatory education for the rabbinate. He, however, was attracted by secular knowledge and clandestinely studied the Russian language, ultimately prevailing on his parents to allow him to enter the Teachers' Institute of Wilna, from which he was graduated in 1881. He was appointed teacher in a Jewish government school in Velizh, government of Vitebsk, in the same year; but a domiciliary visit by the police, resulting from his connection with the revolutionary movement, caused him to flee the country. After many vicissitudes he, in June, 1882, arrived in New York, where he still resides. Having become an ardent socialist while in Russia, he devoted all the time he could spare from work and study to spread his favorite ideas among the Jewish working men of New York. He thus became the pioneer socialistic labor leader among them, and was the first in the United States to deliver socialistic speeches in Yiddish. Cahan was either originator, collaborator, or editor of almost all the earlier socialistic periodicals published in that dialect; and he is still connected with the daily organ of that section of the socialists with which he is in sympathy. He has occupied various positions in labor organizations, from walking delegate to representative at the International Socialist Congress at Brussels. 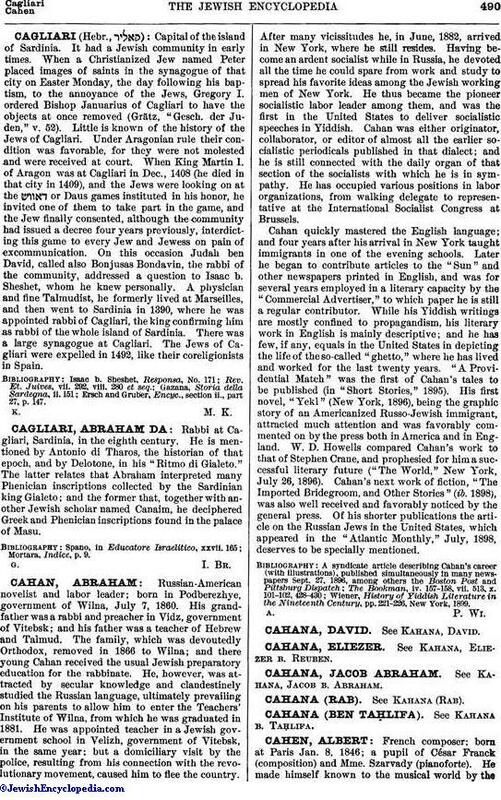 Cahan quickly mastered the English language; and four years after his arrival in New York taught immigrants in one of the evening schools. Later he began to contribute articles to the "Sun" and other newspapers printed in English, and was for several years employed in a literary capacity by the "Commercial Advertiser," to which paper he is still a regular contributor. While his Yiddish writings are mostly confined to propagandism, his literary work in English is mainly descriptive; and he has few, if any, equals in the United States in depicting the life of the so-called "ghetto," where he has lived and worked for the last twenty years. "A Providential Match" was the first of Cahan's tales to be published (in "Short Stories," 1895). His first novel, "Yekl" (New York, 1896), being the graphic story of an Americanized Russo-Jewish immigrant, attracted much attention and was favorably commented on by the press both in America and in England. W. D. Howells compared Cahan's work to that of Stephen Crane, and prophesied for him a successful literary future ("The World," New York, July 26, 1896). Cahan's next work of fiction, "The Imported Bridegroom, and Other Stories" (ib. 1898), was also well received and favorably noticed by the general press. Of his shorter publications the article on the Russian Jews in the United States, which appeared in the "Atlantic Monthly," July, 1898, deserves to be specially mentioned. Wiener, History of Yiddish Literature in the Nineteenth Century, pp. 221-226, New York, 1899.